The Laura Becker Blog: Oh, The Horror! The Horror! 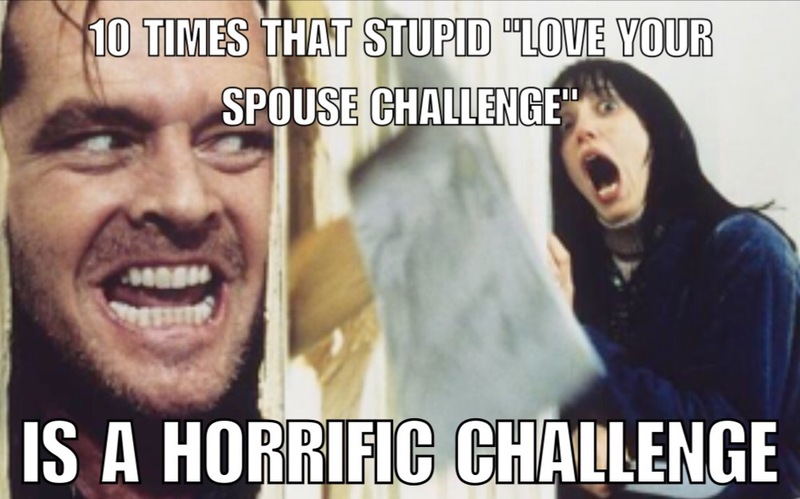 To our horror, my spouse and I have been nominated multiple times over the last several weeks for "The Love Your Spouse Challenge." These were our photos. Because sometimes it's a real challenge, even when you love your spouse to death! When all work and no play is making someone a dull boy! When somebody’s watching something on television that you’re just not that into…like football…on ESPN Classic…from 1992…again. When you realize you have to wake up next to the same somebody…without her makeup on…every morning…for the rest of your life! When somebody used up all the hot water! When somebody reset the thermostat to their own liking and now you’re on the verge of freezing to death in the middle of the night! When you had plans and he calls to say he’s still stuck on the freeway! When it’s been a hell of a day and you start to think maybe this whole marriage thing is for the birds! When despite the fact that you love them, you would do just about anything for them to just shut up already!